Major Publications: Jackson is the author of Making Jazz French: Music and Modern Life in Interwar Paris (Duke University Press, 2003), which now is in its second printing and was a finalist for an award for Best Research in Recorded Jazz from the Association for Recorded Sound Collections, 2004. Portions of Making Jazz French have been reprinted in: Carl J. Guarneri, ed., America Compared: American History in International Perspective, 2nd edition; Humanities: The Magazine of the National Endowment for the Humanities (March/April, 2005); Music and History: Bridging the Disciplines, co-editor and contributor (University Press of Mississippi, 2005). Jackson is the co-editor of Music and History: Bridging the Disciplines (2005) He is currently working on the following book manuscripts Paris Under Water: How Paris Survived the Great Flood of 1910, Safe Savages: France and African-Americans at the Height of the Colonial Project, and The Underground Reader: Sources in the Trans-Atlantic Counterculture (with Robert Francis Saxe). 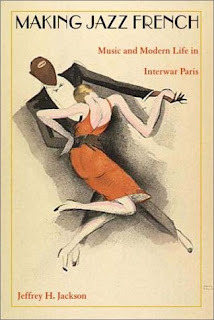 “Making Jazz French: The Reception of Jazz Music in Paris, 1927-1934,” French Historical Studies 25 (Winter 2002). This article won the 2002 Charles R. Bailey Memorial Prize for Best Article from the New York State Association of European Historians; “Music-Halls and the Assimilation of Jazz in 1920s Paris,” Journal of Popular Culture 32 (Fall 2000), and “Making Enemies: Jazz in Interwar Paris,” French Cultural Studies 10 (June 1999) among others. Department Fellowship, Department of History, University of Rochester, 1994-1998. Jackson was named a Fellow-in-Residence at the Columbia University Institute for Scholars at Reid Hall in Paris for Fall 2007. He is a consultant for the PBS documentary “Harlem in Montmartre: A Paris Jazz Story” currently in production. He has previously been a lecturer at the Eastman School of Music and at State University of New York College at Geneseo. I think I can trace much of my current interest in the urban history of Paris to one precise moment. I arrived in the city for the first time as a graduate student just beginning my dissertation research. The Eurostar brought me from London to Gare du Nord, and I immediately went underground to the Metro. So I didn’t really see the city itself until I climbed the steps from the Metro station in my new neighborhood. When I did, I looked around, almost stunned (and somewhat naive), and thought, “Hey, this looks just like Paris!” The buildings and streets around me all looked just liked the classic images I had seen in movies and photographs. Some part of me had expected that the reality wouldn’t live up to the image, but now I saw it with my own eyes. That sense of wonder lasted a long time — it still does in many ways. But as my knowledge of the city has deepened over the last decade, my feelings about it have become much more complex. I walked all over the city on that first stay and in the many visits that have followed, and gained an intimate, ground-level feel for the urban space. Each day was the discovery of another little corner. Now I have my favorite restaurants, parks, and shops, even my favorite streets. I still love to go to Paris because it allows me to live a different kind of life: beautiful walks, wonderful food, a different sense of time and place. But sometimes Paris pushes me away too. At its worst, Paris can feel big, noisy, dirty, and crowded. Enduring the summer heat in an eighteenth century building can be oppressive. And while my French is very good, there are always nuances in the language that escape me. Language slips sometimes make for a lonely feeling because it means that there is some part of my world that eludes me, a missing connection between me and my neighbors. And there are still parts of the city where I always get disoriented. In fact, when I stepped into the street on that first trip, I immediately got lost looking for my apartment. With no knowledge of the city at that point, my fascination quickly turned to worry. But I was found by the Parisians themselves. I asked two women pushing strollers for directions to the cafe where I was to meet my landlord. They said they thought it was further down the street, and I headed off to find it. But a few seconds later, one of them came chasing after me. “Monsieur! Monsieur!” she called out. The cafe was actually the other way, they realized, and they had gone out of their way to help me. From then on, I’ve always found a welcome in Paris every time I visit. Even in those moments when Paris pushes me away, it also pulls me back. And I only want to work harder to know it better. Prof. Jackson’s direction and guidance inside and outside the classroom was a formative part of my experience at Rhodes, and his lasting commitment to his students has enhanced their scholarly endeavors and their intellectual life. To summarize my appreciation for Professor Jackson pithily, I would say this: when I walked into his History 101 class in the spring of my freshman year, I had already decided to study history; and by the time I left his course, I had the wherewithal to study it well. His pedagogical and methodological standards, his demanding expectations, and his determination to make his students more thoughtful and more articulate enriched my time at Rhodes immeasurably. During my sophomore year, Professor Jackson approached me about doing a Directed Inquiry centered on a mutual interest of ours: urban history. The fact that he regarded me as capable and committed enough to handle the course was flattering enough, but what struck me most—and, indeed, what motivated me to make the most of the opportunity—was the spirit of mutual investigation that guided the semester’s work. His willingness to trust me as a partner in thinking through the large, complicated, and important issues we explored empowered me as a researcher, writer, and thinker. The course was a formative experience in the life of a young student. Out of that Directed Inquiry grew a research paper that allowed me to apply my budding skills in a direct and meaningful way. My study of the removal of New Orleans’ Canal St. Streetcar line in 1964 put into consequential practice the approaches Professor Jackson had emboldened me to critique and discuss. In sifting through primary documents, interviewing community activists, and contextualizing the remarkable story of the streetcar, I gained the authentic and applicable experience of an historian. Throughout my writing, Professor Jackson challenged me, supported me, and pulled more out of my pen than I could have thought possible at the project’s outset. During my junior and senior years, Professor Jackson served as the primary advisor for my honor’s thesis. The project was the culmination of everything he and I had studied and everything he had prepared me for, and I have his dedication to thank for its success. The countless hours he and I spent together discussing primary and secondary materials, improving drafts of various chapters, and focusing the text’s arguments crystallized my academic experience at Rhodes.